After a long period of slacking off and avoiding upgrading my lab to vCenter 5.5 – mainly so I can wait for a few more bug fixes to slip into the GA release – I finally took the plunge to vCenter 5.5.0b (build 1476387) . You can view a sped up version of the upgrade in the video above, which goes through the process to update the SSO, Web Client, Inventory Service, and vCenter components. I’ll provide some additional details here around my environment and the upgrade process. This is about as real world as I can make it within the confines of a single HP N40L G7 Microserver (which I use for vSphere management). If I had an unlimited budget and space, I’d step up to a pair of the new HP Gen8 Microservers to allow for N+1, but it just isn’t in the cards at the moment. All of my vCenter related services run on their own service account that has the required level of privileges. My 5.1 environment used a single “standalone” installation of SSO 5.1. I didn’t see any reason to mess around with Linked Mode (I never liked it even at work) or the really wonky caveats that came with HA and Multisite in SSO 5.1. For the vCenter Server service installation, I end up using my generic “Chris” account and then flip over to my service account afterwards – if I had thought about it, I should have just “run as” the entire installer as my service account. To remedy, I stopped the vCenter Server service and swapped out my Chris account for the service account. No big deal, really, but something that you should be mindful about. One other thing I did was upgrade VUM to 5.5. It was basically a next-next-finish sort of thing, and I didn’t feel it was worth including in the video. I always make sure to upgrade VUM to match vCenter. By your powers combined, I am vCenter Server! The 5.5.0b installation is impressively simple. Realistically, the only thing I found to be new compared to the older 5.5 beta installation was the GUI sleekness to the installer. The entire process took about 45 minutes, mainly due to the processor limitations on my management vSphere host. I think it would be more like 20 minutes on a solid vSphere host with more CPU horsepower. Kudos to VMware on a fantastically simple and smooth installer (although I still refuse to ever use the “simpler installer” ever again after 5.1). Make sure to complete your backups prior to doing an upgrade. Seriously. Backups are not an optional step – there is no other rollback. Snap or backup your vCenter Server and related role servers, including their databases, and read the product installation and upgrade guides before you do anything in production. Realistically, it should be the same process, except the “upgrade SSO” warning would not appear since 5.0 didn’t have SSO (and there’s no “RSA” DB for SSO 5.1 to go delete later on, huzzah). I am facing a strange issue, for my client we upgraded vsphere5U2 to 5.5, but we are facing a strange issue. We upgraded the vcenter first and in few days our esxi hosts management ip and vlan details in the portgroup is changed automatically. The vmotion and esxmgmt is in the same vswitch and actually we can see this vmotion port group ip and vlan is copied and applied to the esxi management port group automatically. we have opened a case with vmware and they are investigating as usual now one week no proper reply they said for them also this is new. Great post, Chris! We have been putting off the 5.5 upgrade in our production until a full update has been released. I’m still running 5.0 in my lab. Will definitely be using your post when I upgrade! vsphere/vcenter have become a roach motel. It use to be that we’d jump on the latest and greatest version almost immediately but now we’d have to wait at least 6mos before we upgrade. new capabilities breed new bugs. Things are not that simple any longer. Thanks for the post Chris. Recently, we had to go through the vCenter upgrade on the new Win Server 2012 R2 OS and other than gotchas with vDS, the upgrade processes was smooth. It’s all free-to-use music included with Camtasia Studio, no names given. 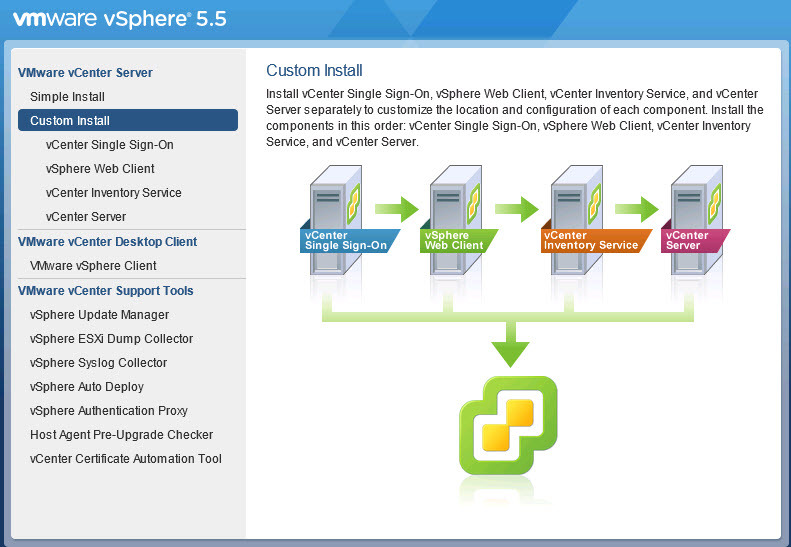 Hi, I have SSO, Inventory service & vCenter 5.1 running on separate servers. I need to upgrade them on 5.5 with all components running on single server (on vCenter server). I tried upgrading SSO on my Vcenter server however for obvious reasons it did not detect previous version of sso on same server and proceed with installation. How could I upgrade them while consolidating them on single machine. I haven’t tested your particular scenario, but seeing as how each component asks where the SSO and Inventory Services are during the upgrade, you could just answer those questions with the new home of your SSO and Inventory Services as you install them on your vCenter Server. Then, remove the old component servers.